I just can’t with this cake. Is this not the most delightfully bonkers looking cake you’ve ever seen? Hello? Are you listening to me? You’re hypnotized, aren’t you? It’s okay, I get it. Welcome back. You can put your shoes back on now and I’ll just hand you back your wallet. Ahem. Last week, when my oldest and dearest friend Heather decided to come up and hang out with us for her birthday, Matt and I knew we wanted to make something really special for her. Her birthday also happens to fall on Valentines Day so instead of going out to an overpriced restaurant, we decided to Nerd it up at home and go ALL OUT. Crispy Duck Breasts with Sherry and Figs. Duck-Fat Roasted Cipollini Onions with Thyme . Baby Kale Salad with Pickled Shallots and a Mustard Vinaigrette. And the pièce de résistance. 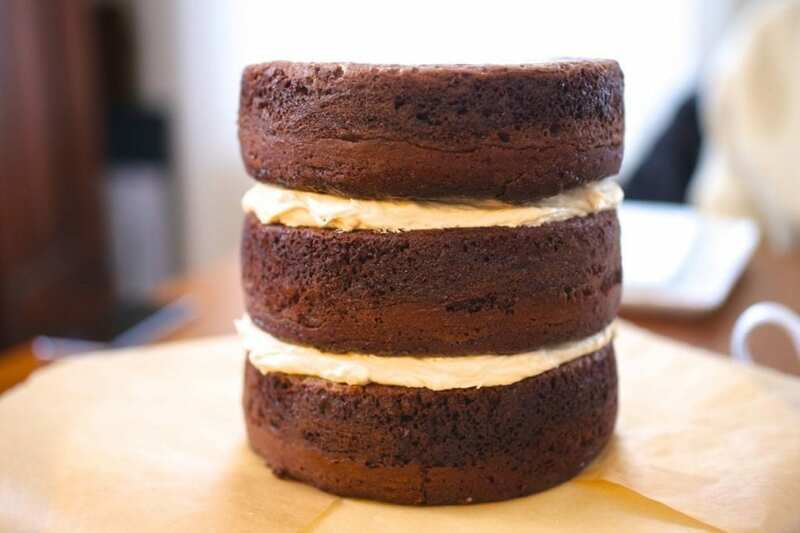 The most decadent, delicious, debaucherous delight, this Triple Layer Chocolate Cake with Salted Caramel Buttercream. [Pauses to polish nails haughtily on shoulder]. I love the modern look of the tall, narrow layers.It’s practically a wedding cake. I might have to divorce Matt so I can marry him again and serve this cake. 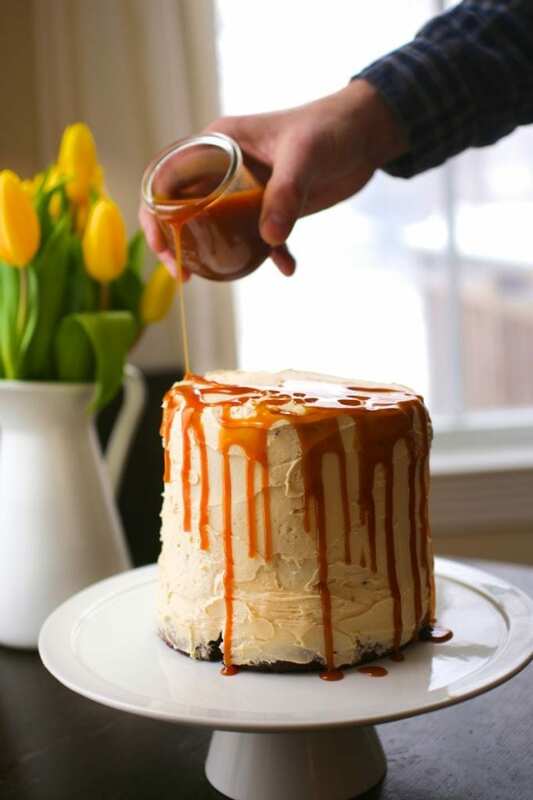 Don’t worry about making it look perfect BECAUSE YOU’RE GOING POUR SALTED CARAMEL SAUCE ALL OVER IT! I think this might be the most delicious chocolate cake I’ve ever made. The fact that it also happens to be gorgeous is… icing on the cake (ba dum tush. I’ll be here all week. Try the chicken. No really, the chicken’s really good too). 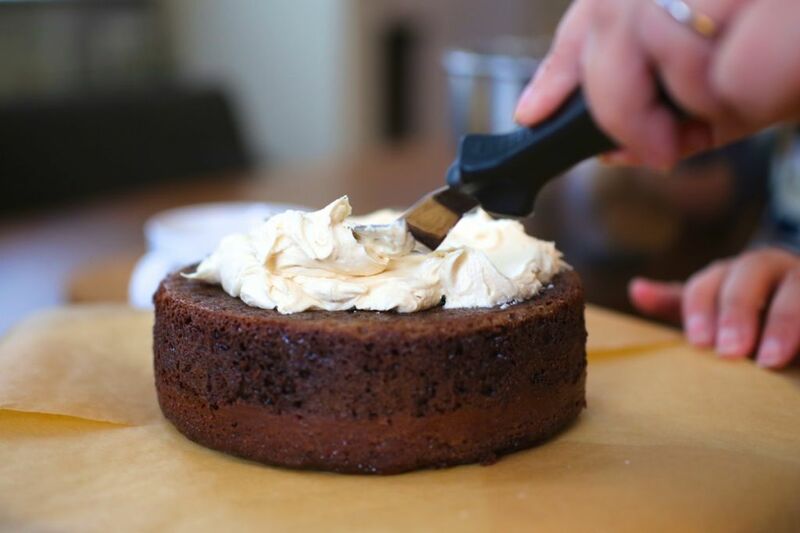 The chocolate cake itself is extremely moist and chocolatey but, let’s be honest here, it’s the salted caramel buttercream that you clicked the link for. And yes, it’s real and it’s spectacular. 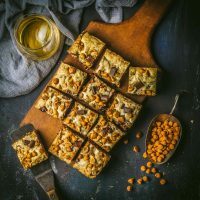 I found the recipe on a delightful blog called Flourishing Foodie and followed it pretty much to the letter, except for adding a little bit of instant espresso powder to the cake batter. This doesn’t make it taste like “coffee”, but it just makes the chocolate taste richer and deeper. 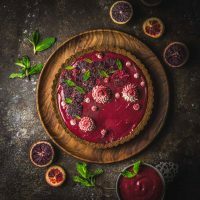 While there are quite a few steps to the process, they’re all really easy and you can even make the caramel sauce up to three days in advance. I actually doubled the amount of sauce that I made (to allow for extra drizzling) and because … caramel sauce. No, you are not crazy. Every picture in this post features a different person’s hands. This is Heather’s debut! Espresso powder is very intensely dark and concentrated instant coffee. It’s not really for drinking, but great for baking. Just a teaspoon or two will give a darker, richer flavor to chocolate recipes, and works very well in chocolate cake. If you can’t find espresso powder, use 1 cup of strong black coffee in place of the boiled water. 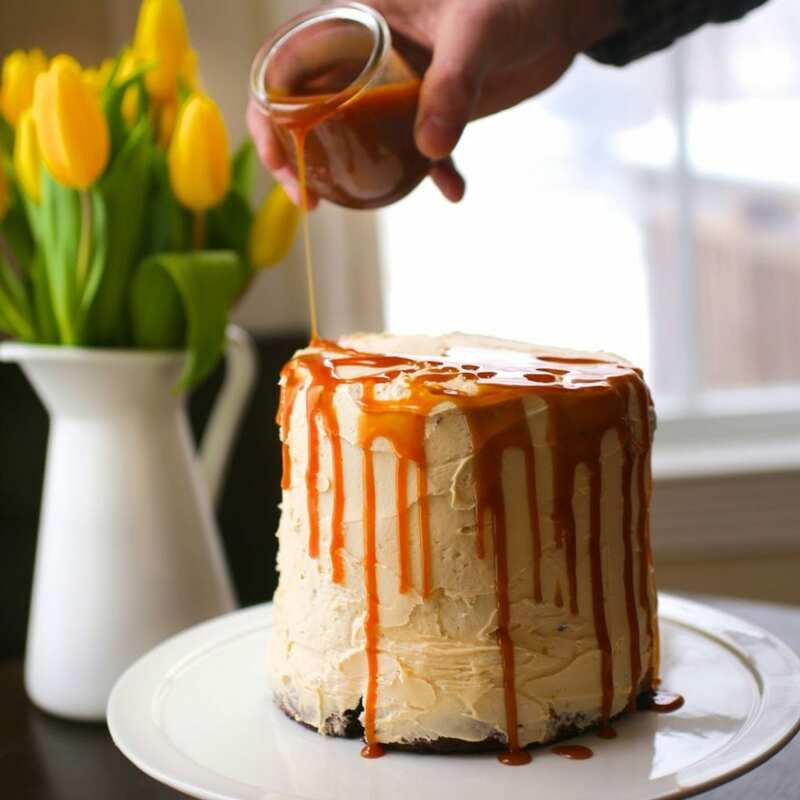 You can easily double the recipe for the Salted Caramel Sauce but make sure you use a large enough pot. It will bubble up intensely when you add the cream. If you double the recipe, make sure you only add a 1/2 cup of the finished sauce to the frosting. You can use two 8 inch cake pans instead of the three 6 inch pans. It should take about 35-40 minutes to bake. This frosting would be amaaahzing on cupcakes. Who am I kidding? This frosting would be amazing on compost. Line three 6" cake pans with parchment paper rounds. Grease the bottoms and sides lightly with butter, and then dust with flour. Tap the pans to eliminate any extra flour. In a large bowl, combine the sugar, flour, cocoa powder, salt, baking powder, and baking soda. Using a whisk, stir to combine the dry ingredients. Add the lightly beaten eggs, canola oil and the milk and combine. Dissolve the espresso powder into the in the boiling water and then stir it into the mix. Your batter should now be quite liquid, like pancake batter. Divide the batter equally into the three pans. 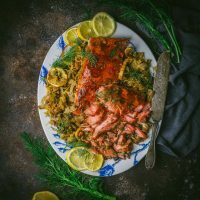 Place into the oven and bake for 30 - 35 minutes. Remove from the oven and let cool for 10 minutes before removing from their pans. Let them finish cooling on a wire rack. Place the corn syrup, water, and granulated sugar in a medium saucepan and stir to combine. Bring to a boil over medium heat. Once the mixture starts to boil, don’t stir it or the sugar could crystallize. You can gently swirl the pan every so often if the sugar begins to brown unevenly (be very careful, it’s HOT). Continue to boil until it thickens and turns a lovely brown caramel color (once it starts to color, it will darken quickly so don’t take your eyes off it). Turn off the heat and slowly stir in the cream, vanilla, salt, and lemon juice with a wire whisk. It will bubble up like crazy for a moment but just keep stirring. If the caramel clumps at all, place the pan back on the stove on low heat, and stir until it becomes smooth. Set to the side to cool completely. In a mixer, combine 2 sticks of softened butter, 4 cups powdered sugar, and ¾ of the cooled caramel sauce (1/2 cup). Beat until smooth and fluffy. Once the cakes have cooled completely, assemble them by placing a thick layer of frosting between each layer. 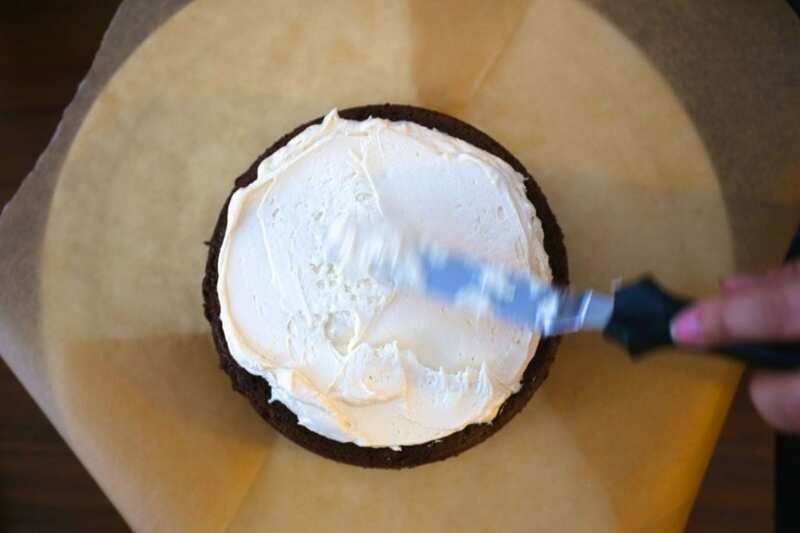 Cover the top and sides with the rest of the frosting and smooth out with a spatula. Drizzle the left over caramel on top. Sprinkle with some flaked Maldon salt. Wow for the outside. I want to see a slice, too! I bet it’s gorgeous. This cake is incredible! And all that salted caramel is seriously making me drool.. just divine! 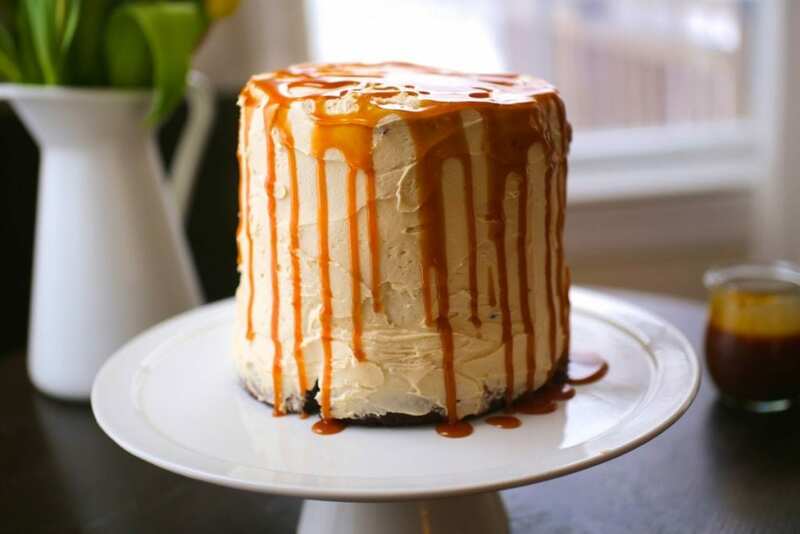 Look at that caramel dripping off the sides of the cake. Can I have a slice, please?! 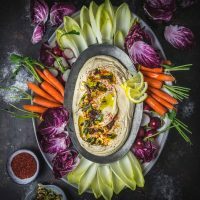 It looks rustic, authentic and so so delicious! Well done! Yes. . yes.. . you caught me. I clicked the link because of the salted caramel oozing down the sides of that tall super model of a cake. 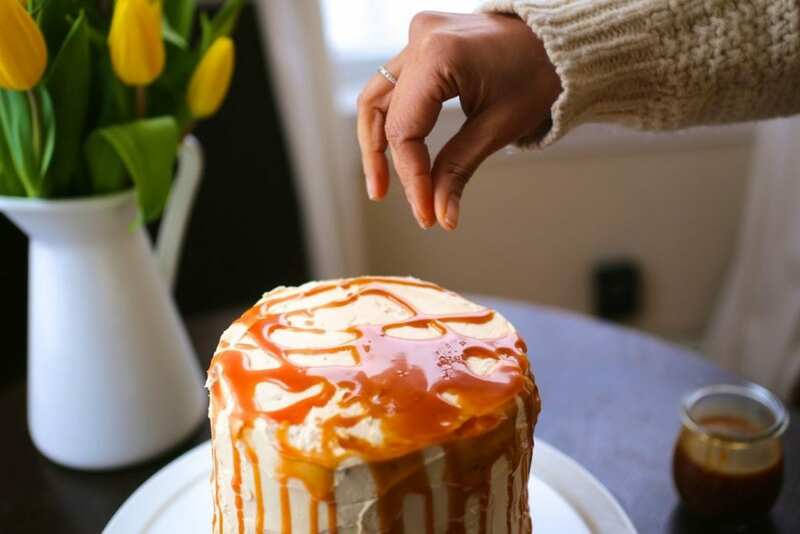 Yes. . .the salted caramel makes me want that cake. But now that I know the cake is moist and chocolaty. . .double bonus.